Its All About Satellites recently installed the 1st MediaTune Com1000 headend in New Mexico at the Triple Sevens Saloon at the Isleta Casino & Resort (formerly the Hard Rock Hotel & Casino). The Triple Sevens Saloon will be having their grand opening on May 9th and we invite you to go check out their incredible bar and our TV distribution system installation and the amazing amount of sports programming on DIRECTV. Buy an extremely expensive matrix switcher and an AMX or Crestron controller system that could easily run $2000 or more PER TV it controls. 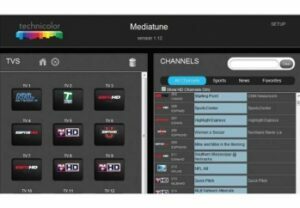 The MediaTune Com1000 headend utilizes TV distribution technology proven for more than a decade to deliver crystal clear HD programming in Free-to-Guest hotel television systems. For bar and restaurant applications it is all controlled via any web enabled device. That means you can control which channel is on which TV with your PC, laptop, iPad, iPod, iPhone or any android tablet or phone. It’s so simple to use, drag and drop, that any of your staff can be trained in its use in just a few minutes. You literally choose the channel and drag and drop it onto the TV icon on the interface. Its that easy. You can watch the same content on all the TVs, or depending on how many tuners are in the system, each TV can have its own tuner allowing your guests to watch a different channel on each one. Unlike matrix switch based systems, with the MediaTune system you can also use more than one device to control the programming shown. Each waitress can control the system from an iPad or Tablet, even the same one you are using for your POS system. This is the perfect system for bars and restaurants. Easy to manage – Simple web server based interface controlled by a PC, Tablet, iPhone or iPad. Less than half the cost of a traditional switched matrix video system using stacked receivers. It’s All About Satellites is the oldest and largest source for DIRECTV for Bars and Restaurants equipment and programming in New Mexico. With over 16 years of experience in the hospitality industry, our staff is ready to support the needs of your bar or restaurant.